NB: Please note that all updates will include links for Westlaw AU only (with the exception of the Journals available on Checkpoint, which will have an extra PDF). For further information, please click here. Consumers of small amount loans are extremely vulnerable, typically using the money borrowed to pay for essential items, such as food, rent or utility bills. These consumers apply for a loan because they have little, if any, savings and are typically on very low incomes. Schedules 3 and 4 of the Consumer Credit Legislation Amendment (Enhancements) Act 2012 (Cth) amends the National Consumer Credit Protection Act 2009 (Cth) to bolster consumer protection in this area by banning “short-term credit contracts”, providing for stricter regulation of “small amount credit contracts”, and introducing nationwide caps on the maximum amount which credit providers are permitted to charge consumers. This article critically analyses the changes brought about by Schedules 3 and 4 and makes various suggestions regarding future changes to the law which should be considered. It is time to re-evaluate the measures by which directors and officers of companies are deterred from behaviour which threatens employee entitlements upon insolvency. This debate has lost the momentum it had at the end of the last century, arguably because of the introduction of taxpayer-funded safety net schemes. However, the misdeeds of company controllers have not decreased, and both liquidators and victims are disillusioned with the relative lack of action from the regulator, the Australian Securities and Investments Commission (ASIC). This article outlines ASIC’s present approach to prosecutions of breaches of the Corporations Act 2001 (Cth) against controllers of insolvent companies, and considers what else might be done to assist in the protection of employee entitlements. 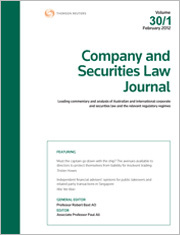 This article considers how conflicting public interests affect the disclosure of information obtained using coercive information-gathering powers, focusing in particular on ASIC’s power under s 19 of the Australian Securities and Investments Commission Act 2001 (Cth), and the abrogation of legal professional privilege and public interest immunity in regards to transcripts of s 19 examinations. Furthermore, it discusses how the Australian Wheat Board and Multiplex cases serve as examples of how the public interest in effective regulation has been prioritised over these privileges, and the public interests behind them. For the PDF version of the table of contents, click here: WAU – C&SLJ Vol 32 Pt 1 Contents or here: CP – C&SLJ Vol 32 Pt 1 Contents.